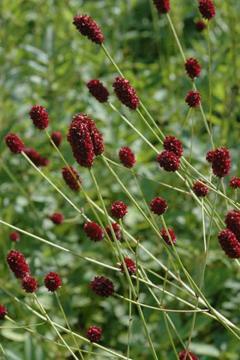 Clump forming perennial with mid-green leaves divided into oval leaflets and producing small, dense spikes of red-brown flowers, on tall stems from early summer to mid autumn. Any reasonable, moist, well drained soil in full sun or part shade. Will grow in poor soils. Very hardy. From seed or by division in spring or autumn. Wildflower often found in damp grasslands.